The first Punjab Roadways bus was flagged off from the new bus stand by the Deputy Chief Minister. It left for Ferozepur via Ludhiana. Three other vacant buses parked at the ISBT left after the function was over. The new bus stand will become functional from Saturday. As many as 225 buses originating from Mohali will now be using the new bus stand and another 725 would also be touching it. The process of online booking will also be started. The old bus stand in Phase VIII has been denotified by the Mohali Deputy Commissioner. The first-of-its-kind busopolis in India was inaugurated here today by Deputy Chief Minister Sukhbir Singh Badal. 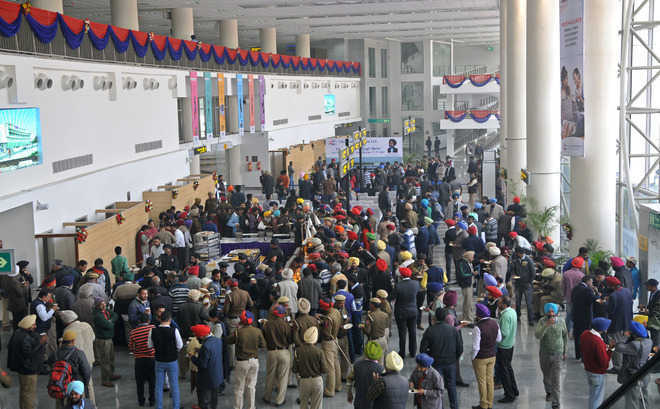 The air-conditioned Baba Banda Singh Bahadur Inter-State Bus Terminal has been constructed at a cost of Rs 300 crore and is equipped with state-of-the-art facilities. Talking to mediapersons, the Deputy Chief Minister said it was India’s first model bus terminal having WiFi , cyber café, medical facilities and shops. It was a model which would be replicated by many other states. It would cater to 1,900 buses daily. Air-conditioned bus stands would also be made in Ludhiana, Jalandhar and Amritsar. The foundation stone of the Adampur airport was also being laid, he added. The Deputy Chief Minister said work on the Kharar-Ludhiana six-lane road would also be started shortly. When completed, the distance would be covered in about half an hour. Four-laning of the Mohali-Patiala road via Sirhind was also being undertaken. Work on the elevated Mohali-Kharar road had been started by L&T. Gurjeet Singh Johar, chairman of C&C Constructions Ltd which has undertaken the project, said 360 cameras had been installed at the ISBT and a control room set up to monitor security. Persons coming to the bus stand would be “scanned” for security reasons. It would take about two years for the whole project to be completed, including a helipad on the rooftop. He said the maintenance of the bus stand would be done by the company for 20 years and that of the remaining project for 90 years. The Deputy Chief Minister told newspersons that he would meet the Union Finance Minister and request him for additional cash flow to Punjab as frustration among people was increasing because of the cash crunch. He said demonetisation was a good step but adequate cash had to be made available to the people. He said he had requested the Central Government to provide funds to cooperative banks so that problems of cash shortage faced by farmers could be sorted out. Asked about the Congress allegation that farmers were committing suicide in the state, Sukhbir Badal said the Congress had been sleeping over the past about 10 years and had suddenly woken up to suicides by farmers close to the Assembly elections. He said the Congress wanted to merely get political mileage by making such allegations. He said AAP had an “unholy alliance” with the Congress. The Deputy Chief Minister also inaugurated the Excise and Taxation Bhawan in Sector 69 and laid the foundation stone of the Road Safety Bhawan in Sector 82.